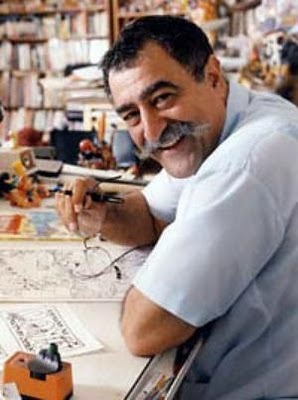 See the gallery for quotes by Sergio Aragones. You can to use those 6 images of quotes as a desktop wallpapers. When you're drawing comics, you get very involved in how the story is going to develop and you spend more time daydreaming on that particular subject. The sad events that occur in my life are the sad events that happen to everybody, with losing friends and family, but that is a natural occurrence, as natural as being born. Comics is a great medium to get a lot of stories out. At the end of the '60s, I was trying to enter the world of comics. For every issue, I send four pages of finished marginals and they select the ones they need. Generally what I produce is new. Of course, they are often variations on the same subject. I keep very weird hours. I never know when I'm going to get an idea. I live in a very small town and now that I've closed down my studio, I'm working at home. I'd love to do a whole series of stories and have them collected into books. If the gag is complicated, you spend more time thinking about the way you're drawing it. My best sources are my travels and my collection of National Geographic. Once you've established where you are, you go to the character and elaborate on expressions and action. Suspense is very important. Even though this is humor and they're short stories, that theory of building suspense is still there. The Boogeyman is your conscience. The Boogeyman is the result of your own bad behavior. I love this Boogeyman. The Western, when I do one, will be one long, continuous story. When sadness happens in the middle of work, I separate my personal grief from my train of thought. With Groo, I try to do one story every book. Sometimes the stories are better if they go a little longer, and I choose to do it in four issues. Eventually I would like to touch all the genres. 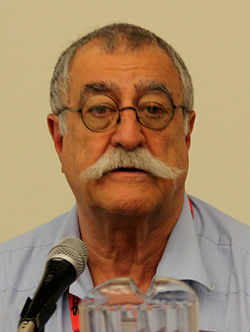 I would like to do some detective stories, and I want to do a Western. I would want to do humorous Westerns. 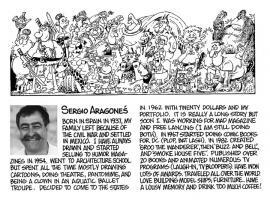 Much more quotes by Sergio Aragones below the page. I have 40 years of unpublished material, the ones they don't pick, and the reason I don't redraw them or use them again is that I like to use my brain every day and come up with new jokes. I have always loved horror very much. I used to write stories for DC's House of Mystery. It was one of my first jobs writing for comics, and I loved it. Sometimes, you start with the drawing and then the gag comes to you in the middle of it. That is when you start working on the solution of the gag, which is composition, placing, equilibrium, and character design. The reason I love comics more than anything else is that the longest story will be just a few pages. With a novel, it takes so many pages to get to one thing happening.